You've probably seen Glitter in the Air everywhere on the internet by now but since I had a specific idea of how I wanted to wear first, here's my version of it. 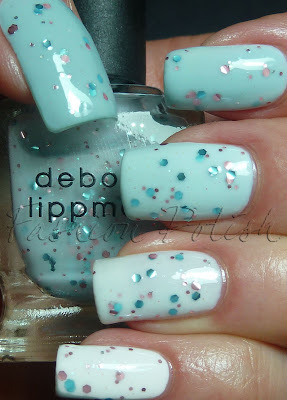 Glitter in the air is a very sheer baby blue base with a grey hue packed with multi sized pink and blue glitter. 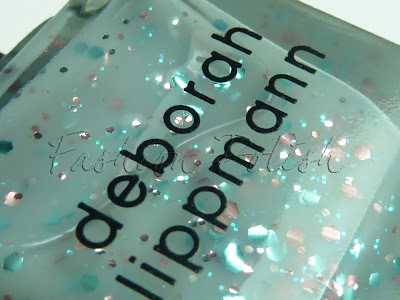 It's not your average glitter but is actually very womanly, soft and delicate. It can be worn alone with a slight visible nail line at 4 coats or can be layered with numerous possibilities. I decided to do an ombre manicure with Chanel Riva and Essie Marshmallow, I just went from thumb to pinkie using less Riva and more Marshmallow. All the pictures are with two thin coats of Glitter in the Air, no topcoat. I don't know about you but I absolutely love the result. I didn't want to loose the sheer / jelly finish, as if the nail polish was transluscent, so Chanel Riva and Essie Marshmallow were just perfect... Actually, I must say that I find it so much more beautiful this way than over a creme. Now I can't wait to hear your opinion on it! This is super cool, I might have to borrow this!! Of course that means I have to actually GEt GITA first ;). This is adorable, I just love this manicure! Thanks girls!!! your compliments mean so much to me right now!!! But, it can depend on how thick/thin you apply your coats so you might have to add another coat of Marshmallow over Riva if it's too blue (or the opposite). The pics are without topcoat to show how shiny it is by itself but you'll definitely need time ahead of you (between coats) and a fast drying topcoat. This is such an amazing way to wear it! Stunning! @ABOP (laquerlove on MUA) Thanks!!! @Sarah Actually I must confess I was thinking about you when I did it... I hoped you'd read the post and enjoy it! Wow this is so gorgeous. Best pics/ layering idea for Glitter in the Air I've seen so far. Love! OMG, I loveeeee it. Even without the Glitter in the Air, the ombre would look fabulous with any other glitter top coat. I'm going to try this with my next mani for sure. Wow! I love ombres but this is so different! Oh my gosh! This is gorgeous. I just discovered your blog today and I think I've already been back three times to look at your pictures. You have beautiful hands/nails and your photos are excellent. Now if only I could find the Chanel Riva, I would try this manicure myself. So pretty! I hated "Glitter in the Air" until now :D this is amazing!!! Gorgeous ombre, well done, cute yet very stylish!!! And the Glitter in the air is so much fun to play with, definitely not your average glitter polish. I've tried it now on top of other pastels, and it goes perfectly on top of corals/salmon shades. I've never tried a ombre before, but now I'm getting inspired to try an ombre with light salmon, and Glitter in the Air. Thanks for sharing and for the inspiration!!! j adore deja le glitter in the air je l ai recu il y a peu !! mais le chamallow il a l air cool comme base !! Gorgeous... I'm so loving this polish. Layered or not. Absolutely love it! Such a great idea! Great job!! This is brilliant! So gorgeous! This is perfect, the ombre, the glitter and your nails! Great! Just read about you on Mary's blog bodyandsoulmary.com. This is a lovely manicure. The polish looks amaing in the botle but too sheer for me on the nail. I love the ways you've done the manicure. Unless there's a good sale of this brand, I'll wait till someone dupes it. I hope that will be soon. It does look awesome !